One of the benefits of having a pilot as a boyfriend is that I can be flown by someone I love and trust. 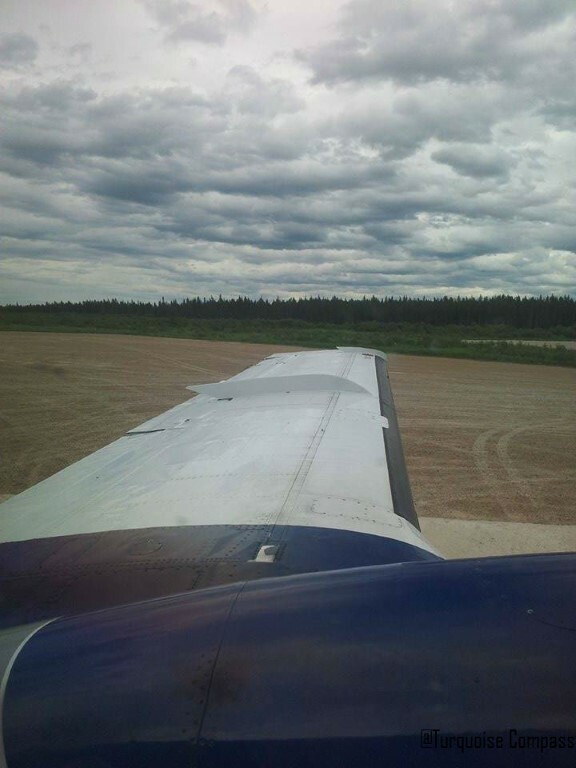 My boyfriend Corey who works for Thunder Airlines based in Timmins, Ontario flew me all over northern Ontario from Timmins to Moosonee to Fort Albany to Kashechewan to Attawapiskat and back to Timmins. This is an opportunity few get. Being flown all over northern Ontario by my boyfriend is a dream; it’s hard to believe that I have my own personal pilot. 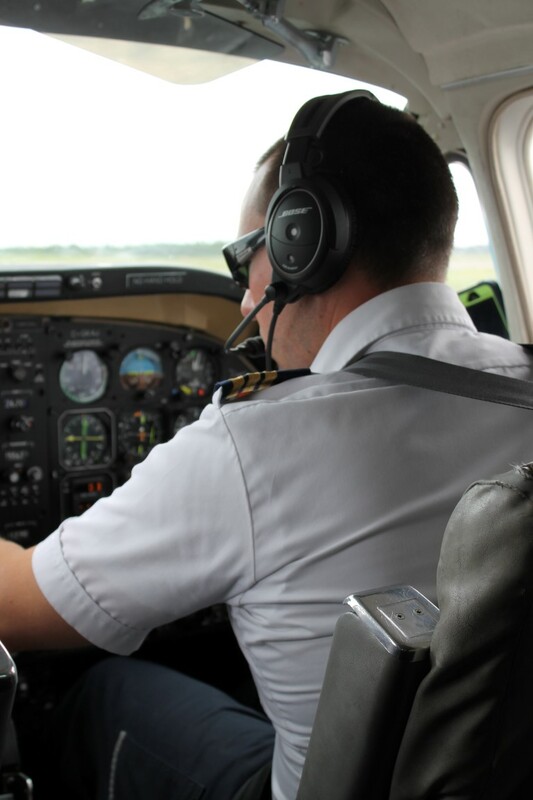 Flying from one small northern Canadian community in a King Air 100 to another is an experience everyone should have, especially Canadians. 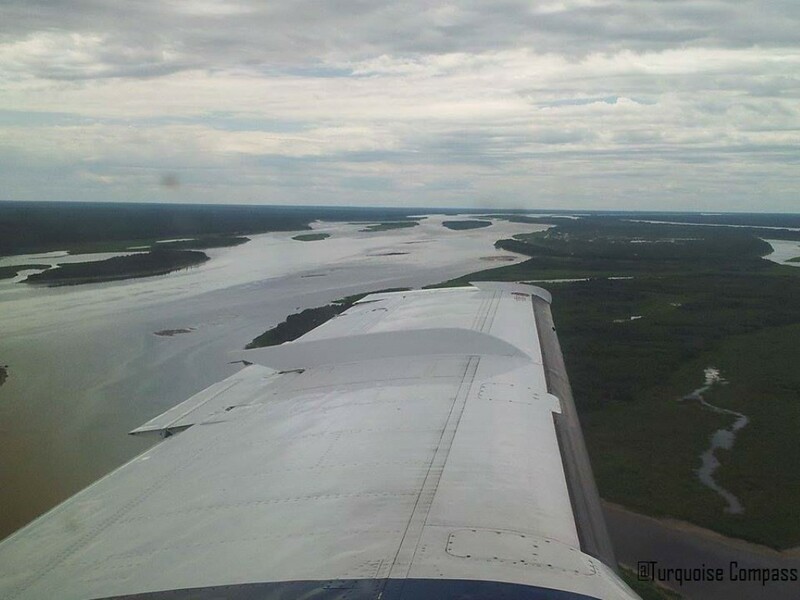 Flying from one James Bay community to another was a unique experience in the fact that I was able to explore more of northern Canada by air. Seeing the landscape from above gave me an entirely different view than I would have received by land. Few people get to land on three gravel runways in one day (or any at all for that matter). Plus, I love flying so it is nothing for me to take 5 flights in one day. After taking 58 flights in the last 12 months, adding 5 more feels like nothing. Lucky for me to have met a pilot since I enjoy flying so much. Since meeting Corey, I have learned much about the aviation world including the popular pilot lingo. I even flew a plane and did two takeoffs. Since most of Corey’s friends are pilots I spend a lot of time with pilots, surprisingly it makes me confident to fly. I could fly everyday with Thunder Airlines while visiting northern destination after another. There are so many unique and remote places to visit including aboriginal communities where the culture is alive and thriving. 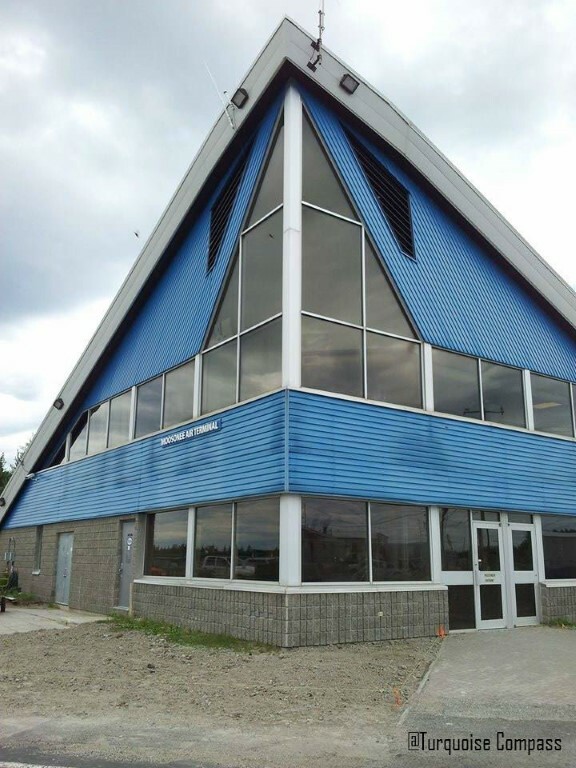 Typically, these northern regions are hard to reach, but Thunder Airlines makes it easy to reach Ontario’s most northern towns and villages. 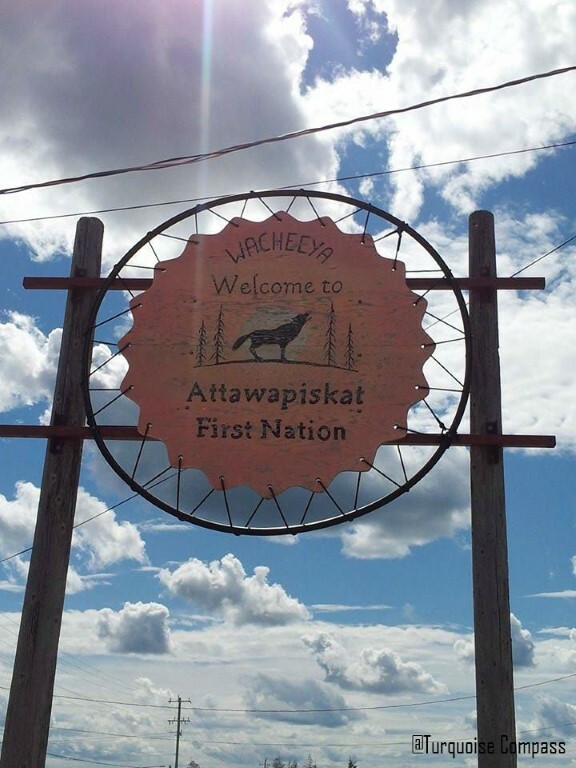 The big welcome sign in Attawapiskat shows the pride the locals have in their village. If only if I had the time to explore each place to experience the best of what each destination offers. I know that I will get more opportunities to explore within Canada, even in the remote and isolated places people don’t normally want to visit. The giant and abundant black flies, horse flies, and mosquitoes won’t keep me away. I am making it a priority to be open to exploring all corners of the world, especially in my big home country. Some of the most uncommon places have given me the most unique experiences. I commit to making the time to explore the ordinary and out of the ordinary. Thunder Airlines makes it easy for me to see the hard to reach and unexpected locations. 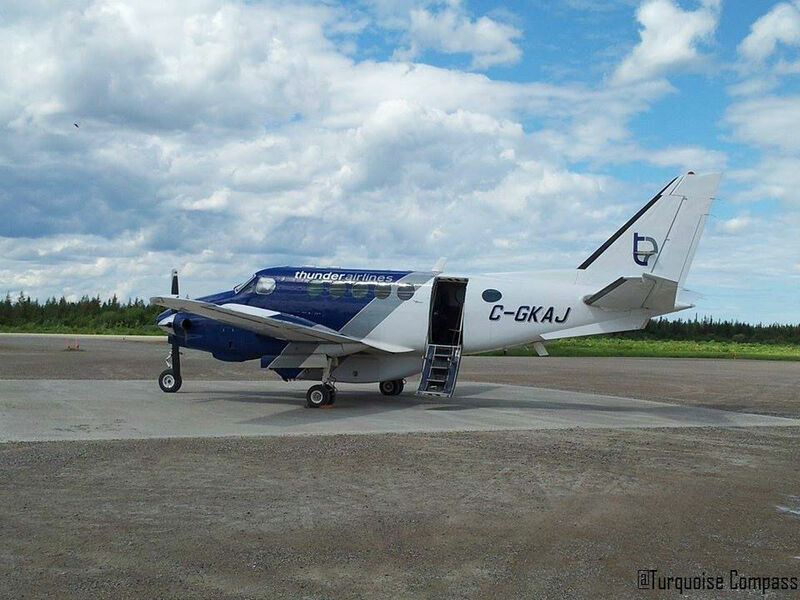 This entry was posted in Canada, Ontario, Reviews, travel and tagged Aviation, Canada, Flying, Gravel Runway, King Air 100, Northeastern Canada, Northern Canada, Planes, Thunder Air, Thunder Airlines, Timmins, Travel, Turquoise Compass by Turquoise Compass. Bookmark the permalink. The biggest issue for me with flying is the staggering environmental impact ~ especially if everyone feels the need to enjoy same experience. Do you consider the environment as you plan your travels? Yes I do actually. My boyfriend and I are extremely environmentally conscious! I always travel with a refillable water bottle and I make a lot of my own cosmetics in travel size containers that I refill each time I go home. We use all-natural, homemade, and organic products. When traveling, I try to only visit parks, reserves, and sanctuaries which give back to the environment and conserve rather than deconstruct (I posted a lot of really good examples when I was in Australia). I also try not to eat at chains, but rather support the local economy (and markets). When I was in Costa Rica, I planted a tree with a group of people at a local school. Someday I’ll be able to go back and see my tree full grown. I can think of countless examples of how my travel is eco-friendly, because it is a growing concern like you said. Since moving to Florida in 2008, our travel has been on hiatus because we’re happy here. I haven’t flown since 2006. I carpooled on one trip to NJ in 2012 (with 4 other people) and took the auto train up a few weeks later to bring my mom here after my dad died. The two major ways we’ve lessened our carbon impact: (1) not having kids and (2) becoming vegetarians. We also downsized to a 1,000 sq. ft. villa which requires less heating and cooling, rarely go shopping for “stuff” (except groceries), eat most meals at home, limit and combine trips in the car, recycle what we can, etc. I suppose every little bit helps, but until our governments get serious about Green and Clean Energy, we are apt to be in for a bumpy ride ~ with droughts, floods, tornadoes, and other manifestations of climate change. These are incredible examples. Have you written a post on your blog on this subject? I don’t know that I could point you to a single post addressed to this issue, but many posts address living more sustainably and simplify with the mantra of Less is More. That’s great that you are integrating it into your posts overall. It’s a really interesting topic. After our recent conversation, I am more aware of the things I can control while traveling (i.e. not buying bottled water, not taking a plastic bag when offered, etc…), while trying not to get overwhelmed by the things I cannot control. Thanks for the reminder. Wow! great way to see it all. Canada just goes up and up and up from Toronto doesnt it? Would love to know more about the far north of the country! Thanks so much. It truly goes up, up, and away! As much as I have seen of Canada, I feel like I have not seen much of it at all (and I’ve seen a fair bit). You’ll have to come and visit and see it for yourself. I know right?! Now if only we had our own private plane (now I am really dreaming! ).